The weather in the UK is absolutely beautiful, there literally isn't a cloud in the sky....well there wasn't last week! . The sunshine of course makes everyone extremely happy and also makes me want to plan things & of course embrace the warmth. I'm very aware I won't be marching the streets in swimwear but I certainly need to think about what new items I'd like for holidays and cheeky sunbathing outtings in my backgarden! I am going away at the end of June for a long weekend - part of my big sisters hen do. I'm very excited as it's not going to be your normal hen do... it's going to be such a chilled out affair. So plenty of swimming, watersports and of course sunning ourselves. I've been browsing the high streets for some of my top picks for the SS12. There are loads out there but its always best to dive in there quick so you get the one you lust for! Now my first option is immediately quite controversial... it's stripes. A bit like marmite you're either loving them or hating them. Personally the stripes and nautical vibe is a must! I love these sort of bikini tops, the twisted effect makes it look fabulous! O'neill swimwear is always extremely well made - I often use their items for surfing in as I know its still going to be attached to me whilst catching a wave! Always a good bonus! I do always tend to opt for bikinis and not swimsuits when going abroad (mainly because I want a tanned tum!) 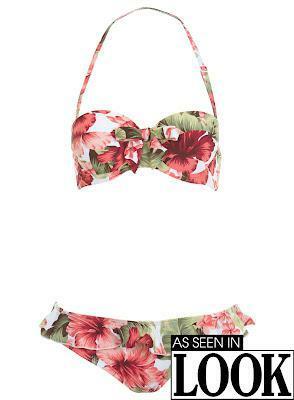 but I adore this floral swimsuit by Ted Baker. It looks like the way the pattern falls, and the shape of it will really compliament the female form! An aqua blue bikini is always great for showing off your tan! Plus I love to have a playful bikini in my reach whilst on my jollies! My last top pick for the SS12 collection of swimwear, is a floral number from Miss Selfridge. The frills give it a delicious 1950's feel to it, thus creating a perfect number for the ladies! The halter style bikini top is extremely flatering - especially for pear shapes. So there you have my top picks for swimwear this season! What do you think? Have you spotted some goodies I've missed?